To meet the market demands, we are involved in presenting highly admired array of Talking Clock. Classy design and long functional life are some of the well known features of the offered product. Lastly, we deliver our assortment in the allotted time frame. Talking Clock from Pedder Johnson. This helps tell the time in dark on the touch of the button. Useful for people with poor vision. Clock can tell the time after programming on the hour, or press button for an immediate time announcement. Our Digital Talking Clock, range has been one of the most innovative and a high seller for us. These clocks are equipped with the clear sound and programs that announces the time every hour and just by clicking on one button they tell the current time. We have been able to offer our clients qualitative Pharmaceutical Gift. It is a set to remind for taking medicines. 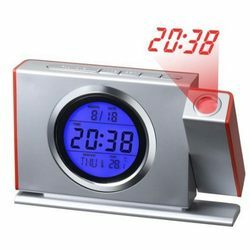 This Talking Alarm Clock reminds you for your medicines at regular interval which you will set on it. Pharmaceutical company give it as gift to doctors, chemists etc. Helps tell the time in dark on the touch of the button. It is useful for people with poor vision.